... on An Awfully Big Blog Adventure - have a look! I'm just back from Orkney, visiting Stromness Primary, and Dounby and Stenness Community Schools, and it was fabulous. The kids were great, the teachers were lovely, the hospitality was delightful ... I will run out of enthusiastic adjectives long before I cover it all! And don't start me on Skara Brae and the Pier Art Centre - 5000 years between them and yet both fascinating, stimulating, and fitting into the land- and seascapes in ways that make the phrase "perfection on a stick" just not adequate. Like Venice, Orkney is addictive, and I will HAVE to go back. And write a book about it. A book that needs lots and lots of on-site research. P.S. And I also spent an evening with the Stromness Writing Group, which was excellent - keep up the good work! 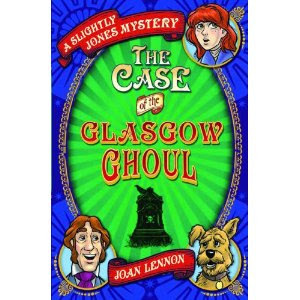 The Case of the Glasgow Ghoul is the Books from Scotland Children's Choice for February! I was really pleased - you know how it is with second children, you worry, don't you. But this is a fine start and I have high hopes for the nipper. P.S. If you haven't been to Slightly's Notebook recently, you won't know about Our Friend the Camel, or seen the Rotating Aerial House of the Future - both well worth a visit! Sinusitis. What a pain. Though I must say, on her it looks good. I suspect bubonic plague would look good on her too, of course. Some people just don't know how to get sick properly. Doesn't she realise you're supposed to go blotchy and have huge frown/squint lines and snap at your children lots? And, for no good reason, gain weight. It's probably the volume of yuck I'm storing behind my face - and that's a thought that should just put me off my tea. I was in the kitchen, moaning my inability to write when I felt like this. "What purpose do sinuses serve, anyway?" I wailed. "They're designed to equalize the pressure in your head so your brain won't explode," a son explained. "But mine are full of yuck!" "Oh dear," said the son, and retreated briskly.